Get ready for the 10th Annual Poetry Jam! Put on your creative writing hats and let's jam! This contest is open to all students in Grades 3–12 AND adults. Students may participate whether public, private or home-schooled. Entries will be accepted beginning April 1, 2019 and must be received by midnight on Friday, April 26, 2019 in order to be eligible for judging. All entries must be original work and not previously published. Contestants and prize winners are asked to attend and to read a poem at the Poetry Jam held on Tuesday, May 7, 2019, at 7:00 pm, at Randall Residence, 6400 S County Road 25A, Tipp City, Ohio. All prizes will be awarded at this time. Download the Poetry Jam Form below for details and entry submission form! ​This April marks the 22nd anniversary of National Poetry Month is held every April, and is the largest literary celebration in the world, with tens of millions of readers, students, K–12 teachers, librarians, booksellers, literary event curators, publishers, bloggers and poets—marking poetry's important place in our culture and our lives. Every April, on Poem in Your Pocket Day, people celebrate by selecting a poem, carrying it with them, and sharing it with others throughout the day at schools, bookstores, libraries, parks, workplaces and on Twitter using the hashtag #pocketpoem. 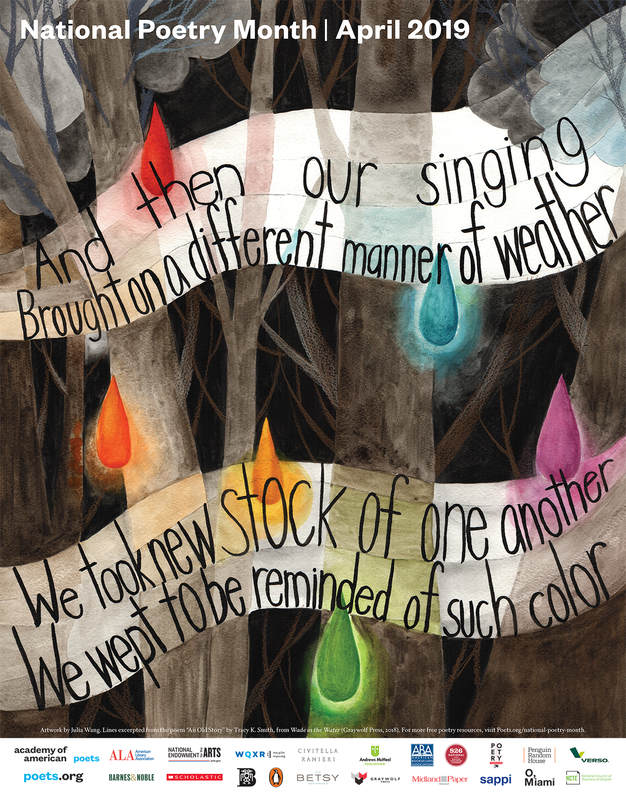 For the first time, the official National Poetry Month poster features artwork by a high school student—tenth-grader Julia Wang from San Jose, California, Wang won the inaugural National Poetry Month Poster Contest—and was selected by judges Naomi Shibab Nye and Debbie Millman, from among twelve finalists and more than 450 student submissions. You can read more about this contest here. Click here for the 2017 Poetry Jam Winners!